The Hungarian Vizsla, also called the Hungarian Pointer, is a medium sized, short coated dog of distinguished appearance. It is an older breed of gun dog, having been depicted in various etchings that date back to the 10th century and manuscripts tracing to the 14th century. The Vizsla was officially recognized by the AKC in 1960. 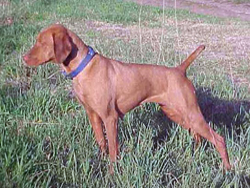 Robust but rather lightly built and lean with defined muscles, the Vizsla is a natural hunter with a good nose and an above average ability to respond to training techniques. Hungarian Vizslas bond quickly with their owner and are very loyal gun dogs. 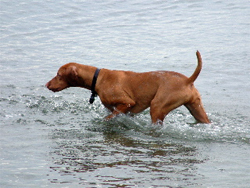 The Hungarian Vizsla as a hunting dog has a good pointing instinct and possess good desire to retrieve on both land and water. They need to be trained with a gentle hand as they tend to be more sensitive than some of the other pointing breeds of gun dogs. The Hungarian Vizsla thrives on attention, exercise, and interaction is intelligent and enjoys being challenged.